played on traditional instruments, with a particular emphasis on dance music. Graham has been involved in Balkan dancing since his post-grad days in Oxford and formed the band to provide music for dancing. He also runs the local Balkan Dance group. Cait is also a keen dancer and like Graham is currently torn between dancing and playing. Cait is also a founder member of the medieval ensemble Gaïta where she plays shawms, harps and various other things. She also runs the local Early Renaissance Dance sessions. Besides music Cait is also an accomplished calligrapher and artist. See some at Gaïta Scriptorium . 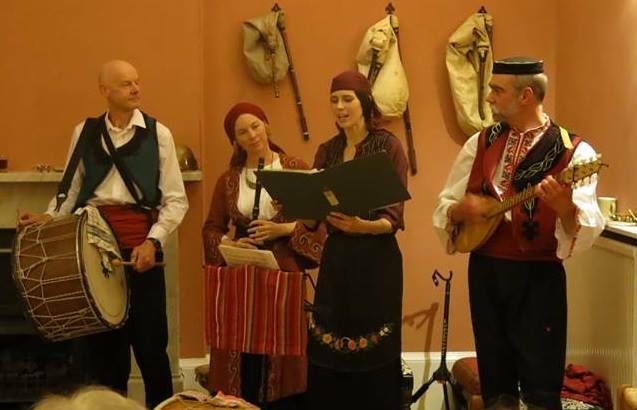 Chris is also director of the medieval ensemble Gaïta (playing medieval fiddles, early lutes and bagpipes) and is also director of the intermittently active Greek folk music group VorioNisi.